Ever wonder what the most popular and unpopular baby names are? And how certain people and places got their names? Or are you just looking for guidance in choosing your childs name? 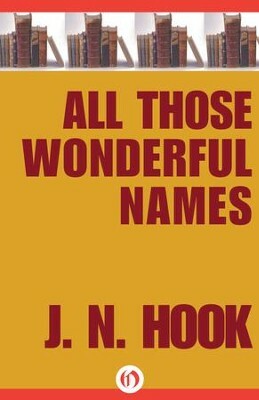 ALL THOSE WONDERFUL NAMES is an amusing exploration of names, familiar words, phrases, and the stories behind their origins. From the common to the confounding, this book has it all. Hear the true stories behind the naming of tropical storms, cars, fictitious characters, major league baseball teams, and more. Find out the real names of celebrities, such as Elton John, Cher, Rip Torn, Cary Grant, Liberace, and Conway Twitty. Discover counties, towns, and cities with strange names like Difficult, Tennessee; Jiggs, Nevada; Virgin, Utah; and Bosom, Wyoming. Learn unusual names for newbornsand perhaps the origin of your own surname as well. J.N. Hook has authored and co-authored more than thirty textbooks on the English language. A former professor of English at the University of Illinois, Professor Hooks first book for the general public was the critically acclaimed THE GRAND PANJANDRUM, a study of rare, useful, and delightful words. I'm the author/artist and I want to review All Those Wonderful Names - eBook.